"Finding My Marbles" ©2019 Janice Tanton. 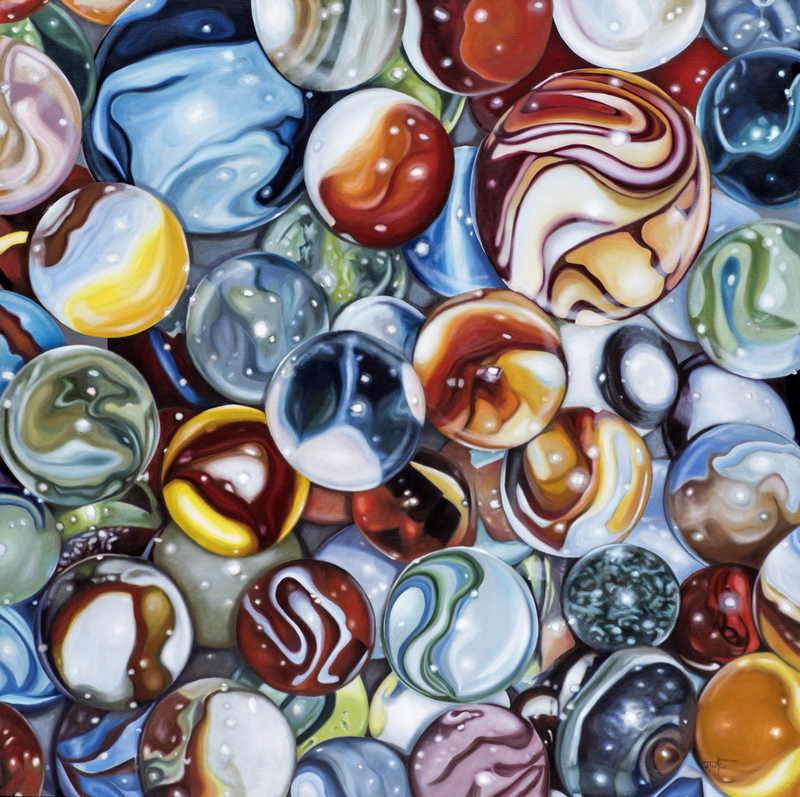 Oil on linen, 48"x48"
Marbles hold a deep fascination from my childhood. It can be challenging and overwhelming to live in the world we are in and recently I had time to pause and consider also, some of the challenges that artists face when confronting issues of social consciousness and polarizing world views. Things can really drive you crazy if you have to think long enough about them. I yearned for the simplicity of my childhood, and had a flashback to more times of wonder, and remembered playing marbles with my school chums and neighbours. Oh, how we loved our marbles – the beauts, the cat’s-eyes, the strawberry rollers, caramel pops…the shooters, the clearsies and the jumbos! I remember looking into each marble and how different they were – how each marble itself looked different as I held it up to the sun and rolled it between my fingers. All the little bubbles and inclusions, themselves adding character and wonderment to a single glass ball. How we coveted our little round glass jewels, storing them in that Crown Royal purple velvet bag, (yes, there will be a painting with that in it as well in the coming days!) holding them tightly as if somehow they also held our own self-worth. Sometimes we’d trade them…sometimes we’d lose them in battle. I’m happy I still have them and that their colour and sparkle has put a little more of a daily reminder forward to me, to play and look at the world a little differently, and through the eyes of that child who could see whole worlds and universes inside their sparkling microcosms. “Finding My Marbles” is the first in this series, a breakthrough piece that has put a smile on my own jaded artist’s face. I’m just pumped to do more, to find ‘my marbles’ and hopefully not ‘lose them’ again. I’m excited to blow them up in size and play with all this beautiful colour that we, as artists, get to play with. I can get lost in them and look at them forever…in a good way! Cool piece, I really like the color variations in it.